Texture refers to the size of the particles that make up the soil. 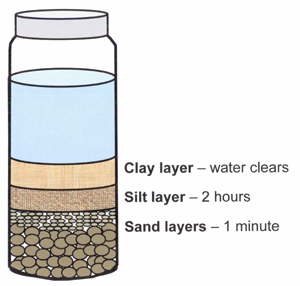 The terms sand, silt, and clay refer to relative sizes of the soil particles. Sand, being the larger size of particles, feels gritty. Silt, being moderate in size, has a smooth or floury texture. Clay, being the smaller size of particles, feels sticky. 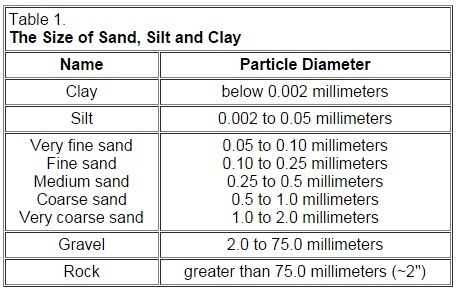 Comparative size of sands, silt and clay. 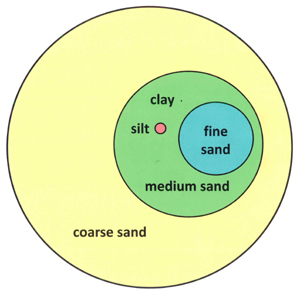 If clay was the size of a dot on the page, silt and sands would be a comparative size. Although this method is generally used by natural builders, it is not exact and doesn't always work. When you have a mix with high clay content it is very probable you don't see any separation between the elements. Spread soil on a newspaper to dry. Remove all rocks, trash, roots, etc. Crush lumps and clods. Fill a tall, slender jar (like a quart canning jar) 1/4 full of soil. Add a teaspoon of non-foaming dishwasher detergent. Put on a tight fitting lid and shake hard for 10 to 15 minutes. This shaking breaks apart the soil aggregates and separates the soil into individual mineral particles. Set the jar where it will not be disturbed for 2-3 days. Soil particles will settle out according to size. After 1 minute, mark on the jar the depth of the sand. After 2 hours, mark on the jar the depth of the silt. When the water clears mark on the jar the clay level. This typically takes 1 to 3 days, but some soils may take weeks. 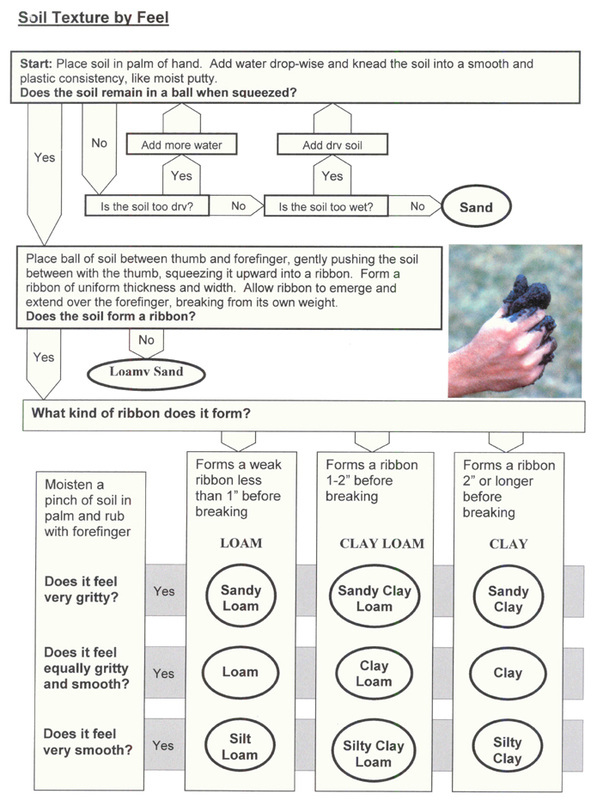 Measure the thickness of the sand, silt, and clay layers. 12. Calculate the percentage of sand, silt, and clay. 13. 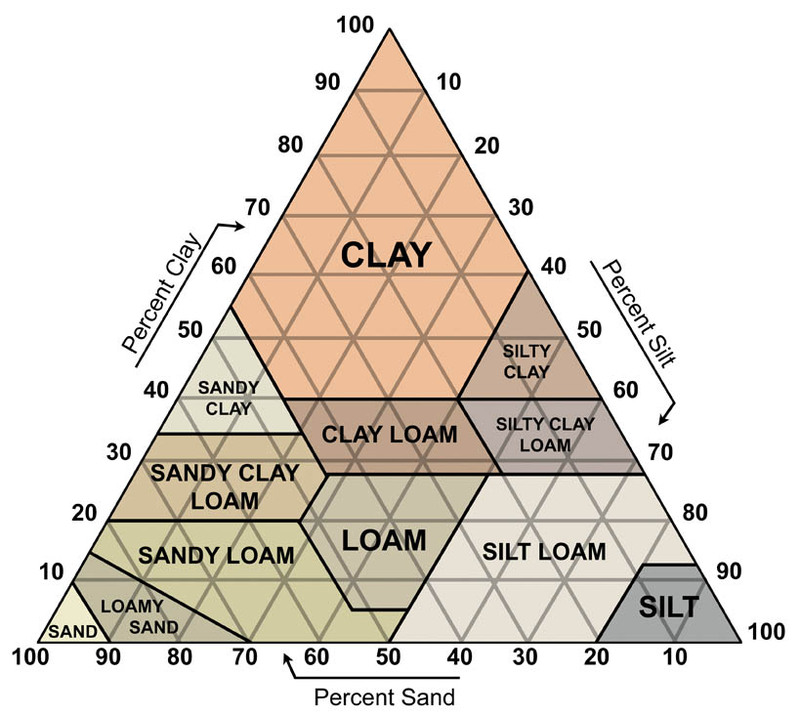 Turn to the soil texture triangle and look up the soil texture class. Texture by Measurement - Measure the depth of the sand, silt and clay layers. Rub some moist soil between fingers. Squeeze a moistened ball of soil in the hand. Coarse texture soils (sand or loamy sands) break with slight pressure. Medium texture soils (sandy loams and silt loams) stay together but change shape easily. Fine textured soils (clayey or clayey loam) resist breaking. Squeeze a moistened ball of soil out between thumb and fingers. Note: A soil with as little as 20% clay will behave as a clayey soil. A soil needs 45% to over 60% medium to coarse sand to behave as a sandy soil. In a soil with 20% clay and 80% sand, the soil will behave as a clayey soil. It is difficult to deterime this ideal proportion as it also depends on other factors (grain size distribution, type of clay, additives, etc.). Typically a 5%-12% Clay mix is used for rendering, while you can go up to 40% of clay mix for COB building. To find out what is the best mix is just to try it out! Usually you want to start from a clay-ish soil as it is easier to add sand afterwards. When you would have a sandy soil you would need to add clay to it, which is harder to do. You can check the proportions by adding different volumes of sand to the soil while keeping the straw or other reïnforcement material (woodchips, hair, etc.) constant. This method is in most cases the most reliable and it's the one I always use when working with a new batch of loam.